A smarter approach to website design. Growth-Driven Design is a client-focused approach website design. It cuts the risks of traditional web design, shortens the time to launch, focuses on real impact and continuous learning and improvement. Growth-Driven Design is the new standard for delivering successful website redesigns that bring measurable business value. It is smarter, agile as well as data-guided and produces high performing websites. Build a strong understanding of a potential buyer and how the website might fit into their life to solve problems or help them achieve goals. Create a detailed, priority list of features needed to solve user challenges and drive value. Create an initial website that delivers strong initial value to the users. Launch quickly then review new features based on the feedback and data from the site users..
Use feedback from real work data to test assumptions and modify design. Choose new features based on data. Carefully measure results and add new features where they fit agreed targets and goals. Repeat the process to continue to improve and refine the site. Risks With Traditional Web Design? The average small to medium-sized business (SMB) website typically costs anywhere between £15,000 - £80,000, a substantial up-front cost for most businesses. Not only is this cost hard to budget for all at once, but it is also paid in full before even knowing what impact the website will have on your business. In addition to the up-front expense, the average SMB website typically takes three months to complete and requires a great deal of resources and energy from your team. This amount of time to invest -- with no business results to show from it until after it launches -- is enough to make any boss get a bit uneasy. Even if the budget and time is approved, there are so many moving parts, people and steps involved in a large project, it’s extremely difficult to accurately quote the cost and determine how long a project this large will take. This makes it extremely common for a website project to be delayed and/or run over budget. This not only stalls out the results from your website, but also reflects poorly on you in the eyes of your boss and other department heads. So the question becomes: after all of the time, money and resources you’ve put into your website redesign, how do you (or the agency you’ve hired) know that what you’re finally launching is the best possible performing website? The answer is you can’t, it’s impossible. All you can do is look through all your usage data, perform some user research and formulate a hypothesis of what you believe to be a high-performing website. Then this hypothesis is launched and never validated to see whether what we thought was in-fact correct. We’ve all heard of these horror stories of a website being launched and then the website’s performance tanking for one reason or another. A Smarter Way To Think About Web Design. As you learn, inform marketing and sales (and vice versa). We work to avoid the risks of traditional web design by taking a systematic approach to shorten the time to launch, focusing on real impact and continuous learning and improvement. We are constantly researching, testing and learning about our visitors to inform on-going website improvements. Through continuous improvements we can reach peak performance. 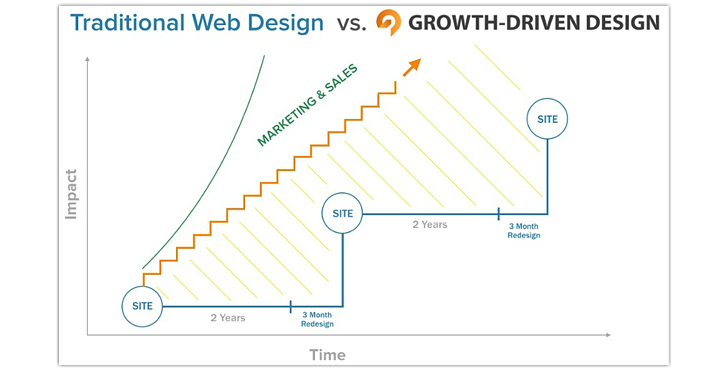 Growth-Driven Design is tightly integrated with marketing & sales. What we learn about visitors helps inform and improve marketing & sales strategies and tactics (and vice versa). 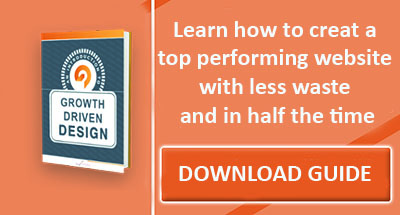 Download our guide to Growth Driven Design and then contact us for an honest evaluation of your web project.